When Microsoft released Windows 10, they ensured one thing that you’ll get automatic windows updates often. Besides, it is necessary to keep your Windows 10 updated with latest features and security updates. Pausing Automatic update in Windows Insider builds is very easier for 35 days. But in Windows 10, you won’t be able to disable windows update directly. In this guide, we added several ways to disable automatic windows updates by disabling Windows update service and editing windows update registry. Well, I have tried to put everything to solve the below queries. + How to stop automatic updates to save your internet bandwidth. + Turn off automatic updates windows 10 and older operating systems. + How to prevent Windows 10 from installing by disabling windows update. + How to prevent Windows 10 from downloading to save internet data. + How do I stop windows 10 upgrade because I don’t want it yet? TIP: To stop windows 10 update, simply you could have turned off the automatic windows update, and you’re good to go. It will prevent upgrade to Windows 10 but to check for updates you have to enable the Automatic Update feature again. Are windows 10 updates automatic? Yes, it is unless you are not on a metered connection, Windows updates is set to download all the updates automatically. Looking in Windows updates settings gives you nothing but option to whether ask you to reboot your computer after installing updates. This method is supposed to disable automatic updates windows 10 home as well as disable automatic updates in Windows 10 Pro. So let’s start how to turn off windows 10 updates permanently by disabling the service. To wrap it quickly you can just watch this video, scroll to read the steps. Step 1. 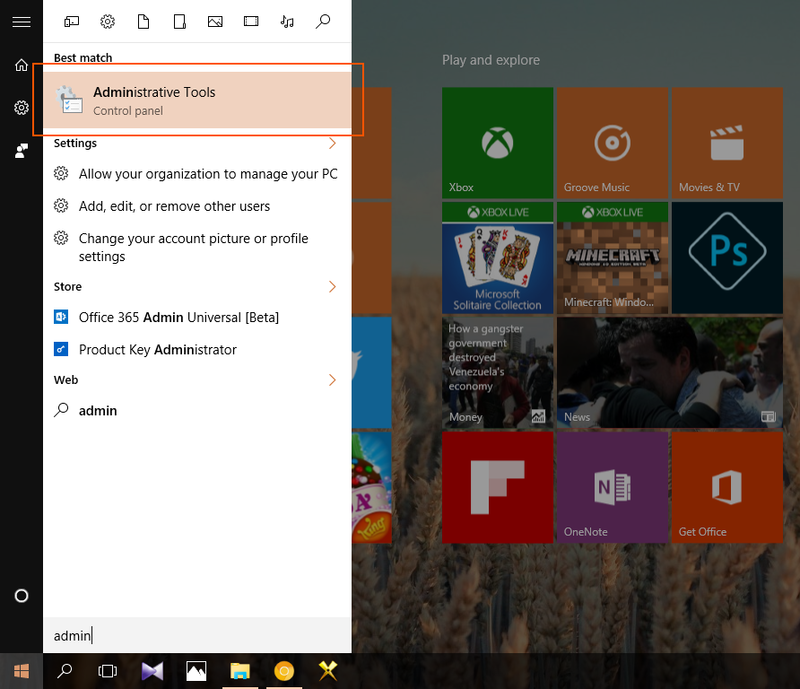 You need to open ‘Administrative Tools‘ on your Windows 10 machine. Press Windows + S and type ‘Administrative Tools’ to find it real quick. You will see something called Component services double click on that. Step 2. Under the console root, you will see three tabs. Click on the ‘services (local)’ tab and find Windows update service, go to its properties by double tapping it. There is a drop down list of ‘startup type’ choose Disabled and save it. Step 3. Check if this stops updates. Click on the start button, and type ‘Windows Update’ and check for updates your computer is not just going to use the internet. So yes Windows 10 won’t download the updates automatically and left you with this message. Step 4. (Rollover) That’s all, in future if you need to turn on the windows update, go again on windows update properties (Component Services) and set the startup type as ‘Autostart or delayed start’ you may need to restart your computer to take the effects. The odd is even you can also disable windows updates in windows 7 using this exact steps. If you are on Windows 7 you, PC might ask to update to Windows 10, and you may just not want to update that computer so that you can disable Windows 10 update in Windows 7. Below are the some frequently asked questions regarding disabling windows update. I hope you find all your answers below. windows 7 disable Windows 10 upgrade: Use this guide, it’s working fine to avoid Windows 10 update when you are running a Windows 7 machine. I don’t want windows 10 stop asking: The Windows itself is not an artificial intelligence, You can set the windows updates to off if you are on Windows 7, and you can use the guide to do the magic. Similar to how to stop Windows 10 from installing you might not want to fall into Windows registry, just go to Windows 7’s Automatic updates settings and set it to off. How to disable updates in Windows 7: While using Windows 7 search and open Windows Update and go to its settings and set the drop down to ‘Never install windows updates’. Disable windows update registry windows 7: I think that one is rather dull than complex, so I might avoid any interface into Windows registry. Yes, it can break your full system if not handled wisely. Only Windows 10 Insider users will be able to pause updates, you can grab Insider preview here. Open “Window setting > Update and security > advanced options” and from there you can post automatic updates for at least 7 days. But remember after a week your device should be updated in order to cause automatic updates again. If you are connected to a WiFi network, there is a option in windows settings to set a WiFi connection as metered, afterwards, Windows won’t use this connection to download updates. Click on the “Network Icon” in the taskbar and go to “Network and internet settings” Choose Wifi from the sidebar then click on “Manage Known networks” choose the network you’re currently connected and toggle the “Set metered connection” option. That’s was all about turn off windows updates permanently, But windows updates are worth unless your connection is fast and unmetered. There are several more methods to do the same and this guide will take you through them. If you like this ‘how to disable windows update in windows 10’ guide, make sure to share it with your friends. Some people may point out recent Windows 10 update problems, so if you think you can’t keep up with your computer by taking caring it a lot, you might want to disable the automatic windows updates so you won’t get into any trouble. Videos you might be interested: Making windows 10 start menu ‘Full Screen’.